The Washington Nationals’ early offensive outbursts were not enough to withstand a slowly developing rally by the St. Louis Cardinals, and the first postseason Major League Baseball in D.C. since 1933 ended with a 9-7 loss in Game 5 of the National League Division Series. 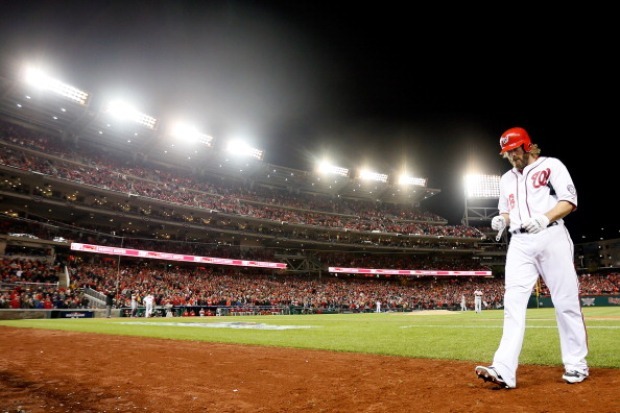 Like Game 6 of the 2011 World Series, the Cardinals found themselves down to the last strike twice in the ninth inning, but they tagged Nats closer Drew Storen for four runs to cap a comeback that started when they were down 6-0 in the fourth inning. When Storen had the Cardinals down to their last strike with two outs, he walked Yadier Molina and then David Freese. He allowed two-run singles to Daniel Descalso and Pete Kozma. It was the largest comeback ever in a winner-take-all postseason game, according to STATS LLC. No other club in this sort of ultimate pressure situation had come back from more than four down. The Nats’ bats were on fire at the start. Jayson Werth followed the Nats’ last at-bat Thursday – a dramatic walk-off home run – with their first at-bat of Game 5 and stroked a double. Next up, Bryce Harper drove Werth home with a triple. 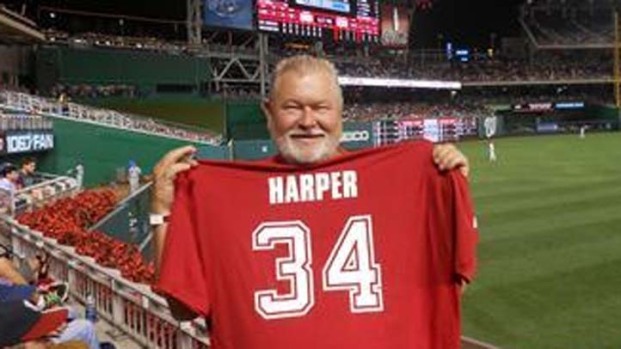 Then Zimmerman brought himself and Harper home with a two-run dinger. Then Cardinals pitcher Adam Wainwright found a groove, striking out the next batters to end the first inning down 3-0. The Nats added a fourth run on a Harper solo shot in the third inning, stirring the Cardinals’ bullpen. Wainwright was chased three batters later when Michael Morse drove in Ryan Zimmerman with a two-run shot to put the Nats up 6-0 after three innings. It was first time Wainwright had allowed more than one run in any of his 12 career postseason appearances, the Associated Press reported. Joe Kelly finished the third inning and pitched a scoreless fourth. The Cardinals began their slow climb back in the top of the fourth when a Matt Holliday double drove in Carlos Beltran. In the fifth, the Cardinals trimmed the deficit to three runs, as Nats ace Gio Gonzalez suddenly couldn’t find the plate. The Cardinals loaded the bases with nobody out -- a double by Descalso, a single by Kozma and a walk to pinch hitter Shane Robinson -- and Gonzalez was lucky to get out of the inning having given up only two more runs. He got Jon Jay out on a soft liner, then bounced a wild pitch in the dirt that allowed Descalso to score. Gonzalez walked Beltran to load the bases again and bring the tying run up to the plate. Holliday could only manage a tapper in front of the plate, and Kozma was forced at home. Gonzalez issued a bases-loaded walk to Allen Craig -- the pitcher’s third of the inning -- making the score 6-3. Gonzalez got Yadier Molina to fly out to right to end the inning, and his night was finished. Trevor Rosenthal retired the Nationals in order in the bottom of the fifth, and Edward Mujica emerged unscathed in the sixth despite allowing two base-runners, including Kurt Suzuki, who had the Nats’ first hit since the Morse home run. St. Louis inched closer in the seventh. Game 3 starter Edwin Jackson came in for reliever Sean Burnett and walked John Jay, who moved to third on a Beltran double and scored on a Holliday ground out. With Tyler Clippard pitching for the Nats, Descalso led off the eighth inning with a solo home run to close the gap to 6-5, but Clippard was able to shut down the Cards for the rest of the inning. 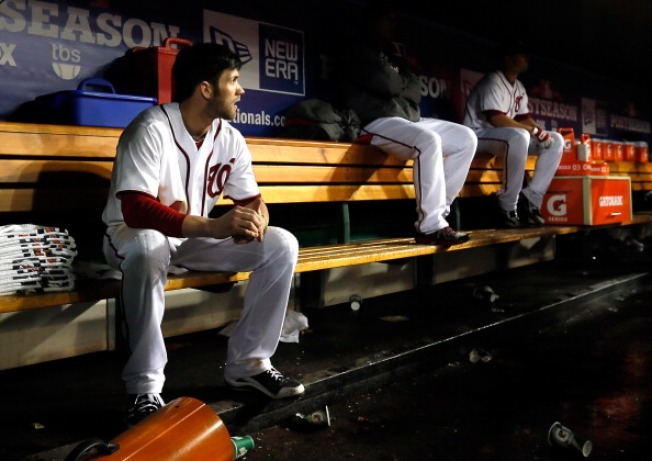 The Nationals’ cold bats awoke again in the bottom half of the inning. LaRoche and Morse led off with a pair of singles off Cardinals reliever Jason Motte. Ian Desmond grounded in to a fielder’s choice to give the Nats runners at first and third. After a foul pop out by Danny Espinoza, Suzuki singled home LaRoche to extend the lead to 7-5. But Storen coughed up the lead in the ninth. The defending World Series champion Cardinals got a tying two-out, two-run single from Descalso and a go-ahead two-run single from Kozma to complete the rally. Motte fared better for the Cardinals, pitching a one, two, three inning to win the game and the series. Little consolation now, but the way the Nats are built, this team should contend again next season. Washington lost baseball when the Senators moved to Texas after the 1971 season and didn't get it back until the Expos moved to D.C. in 2005. The team they got needed some work, finishing last in the NL East in five of its first six years while new owners were found, a stadium was built and a farm system was rebuilt. The 100-loss seasons in 2008 and 2009 were particularly brutal, but they put the Nationals in position to take blue-chippers Stephen Strasburg and Harper with consecutive No. 1 overall draft picks in 2009 and 2010. This was Washington's first elimination game since the 1925 World Series when the legendary Walter Johnson lost by the same 9-7 score to the Pittsburgh Pirates. The Senators held a 6-3 lead in that game. The Cardinals now head to San Francisco to start the National League Championship Series against the Giants Sunday.